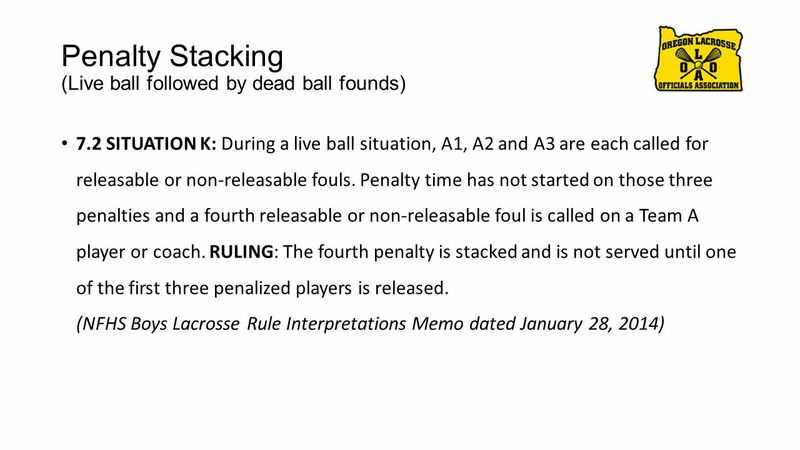 Penalty Stacking Situations based on the 2014 NFHS Boys Lacrosse Rule Book and the NFHS Boys Lacrosse Rule Interpretations Memo dated Jan 28, 2014. Prepared. 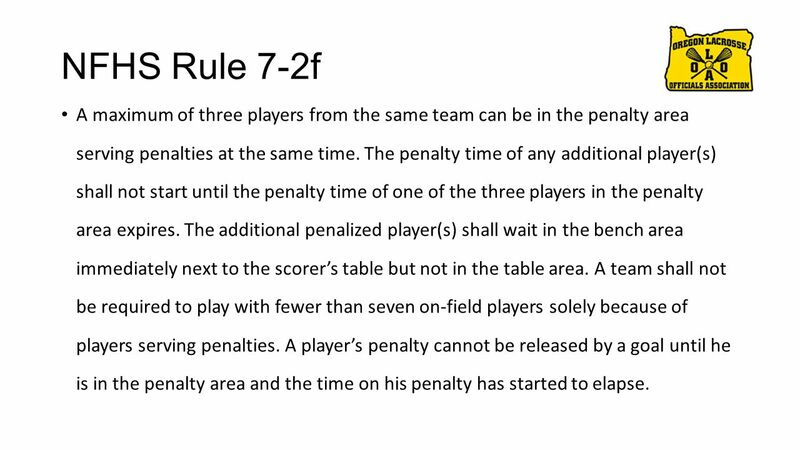 2 NFHS Rule 7-2f A maximum of three players from the same team can be in the penalty area serving penalties at the same time. The penalty time of any additional player(s) shall not start until the penalty time of one of the three players in the penalty area expires. The additional penalized player(s) shall wait in the bench area immediately next to the scorer’s table but not in the table area. 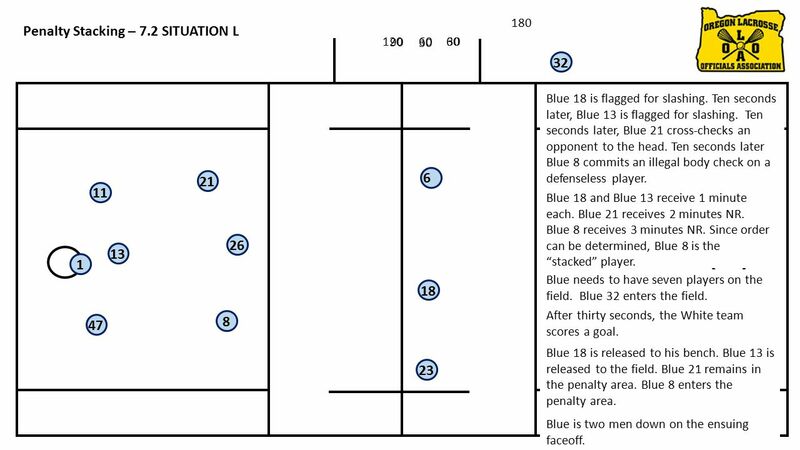 A team shall not be required to play with fewer than seven on-field players solely because of players serving penalties. A player’s penalty cannot be released by a goal until he is in the penalty area and the time on his penalty has started to elapse. 4 11 47 1 13 21 26 8 32 23 18 6 Blue 21, Blue 13, Blue 18 and Blue 8 each slash an opponent. 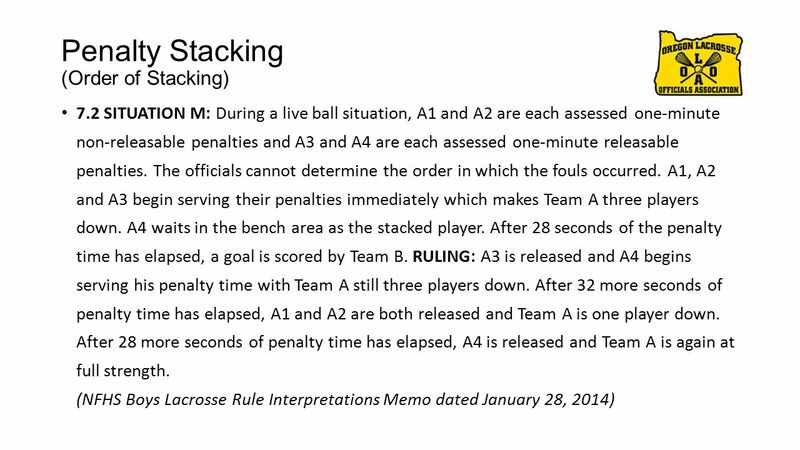 Each are assessed a 1 minute releasable penalty. 60 Blue 8 becomes the “stacked” player and waits in his bench area next to the table. 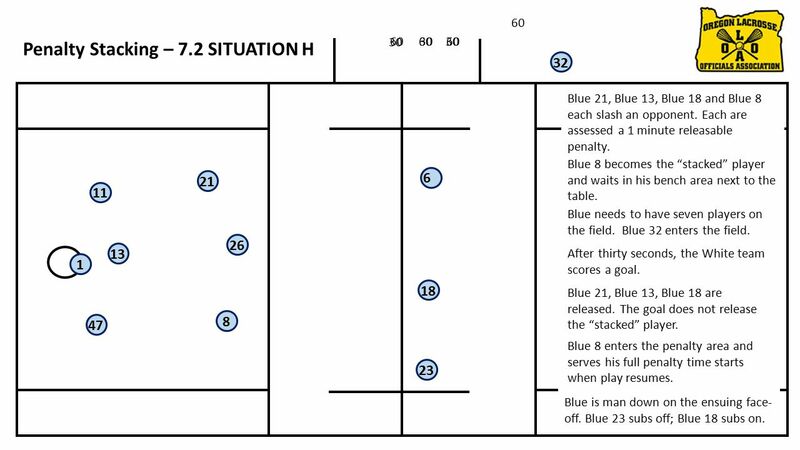 60 30 Blue needs to have seven players on the field. Blue 32 enters the field. 60 After thirty seconds, the White team scores a goal. Blue is man down on the ensuing face- off. Blue 23 subs off; Blue 18 subs on. Blue 21, Blue 13, Blue 18 are released. The goal does not release the “stacked” player. Penalty Stacking – 7.2 SITUATION H Blue 8 enters the penalty area and serves his full penalty time starts when play resumes. 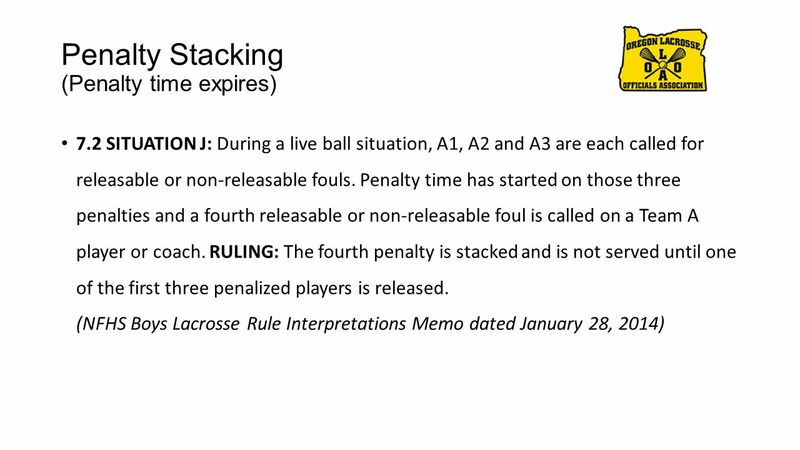 Download ppt "Penalty Stacking Situations based on the 2014 NFHS Boys Lacrosse Rule Book and the NFHS Boys Lacrosse Rule Interpretations Memo dated Jan 28, 2014. Prepared." 2009 ABOA REFRESHER EXAM PREPARED BY; MORGAN MUNROE INTERPRETER. National Federation of State High School Associations Take Part. 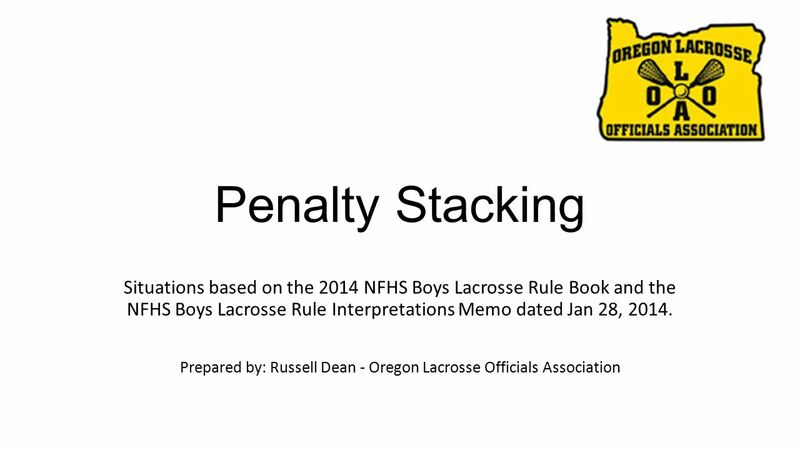 Get Set For Life.™ 2014 NFHS Boys Lacrosse Rules Interpretation Meeting Keystone Lacrosse. Multiple Fouls Rule Simultaneous Fouls  Simultaneous fouls are fouls called on players of opposing teams during  a live ball or. TECHNICAL FOULS EMLOA DEVELOPED BY MATT CROTEAU. What is a technical foul? Technical fouls are those of a less serious nature than personal fouls. Include. Meeting 2/24/13 Keystone Lacrosse Officials Association. 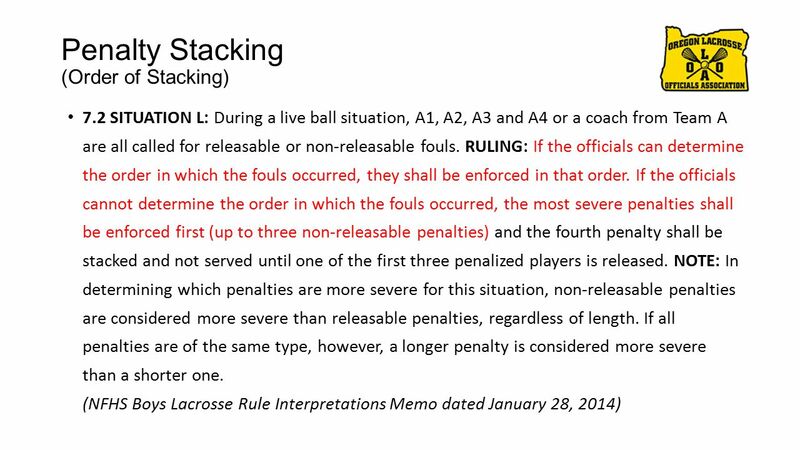 2015 NFHS Boys Lacrosse Rules Changes Brendan Wallace – N.C.L.O.A. Rules Interpreter James Amen - N. Y. State Coordinator of Boy’s Lacrosse. 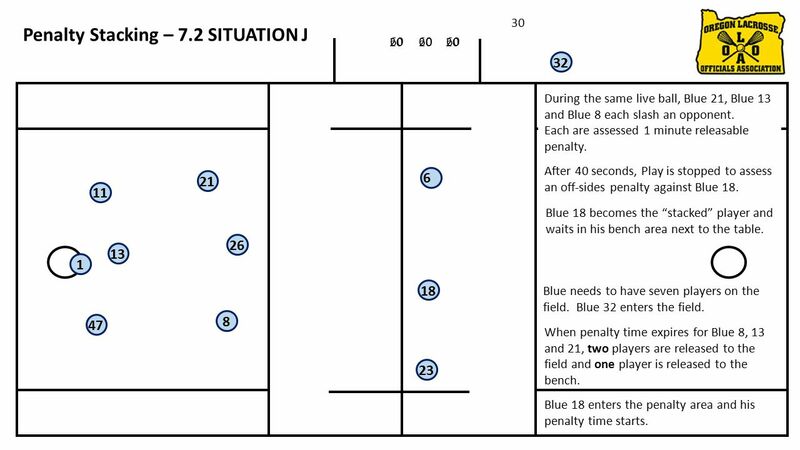 2012 Ice Hockey Exam 21. A goal is awarded when the puck does which of the following? A. Completely crosses goal line. B. Is on the goal line. C. A portion. 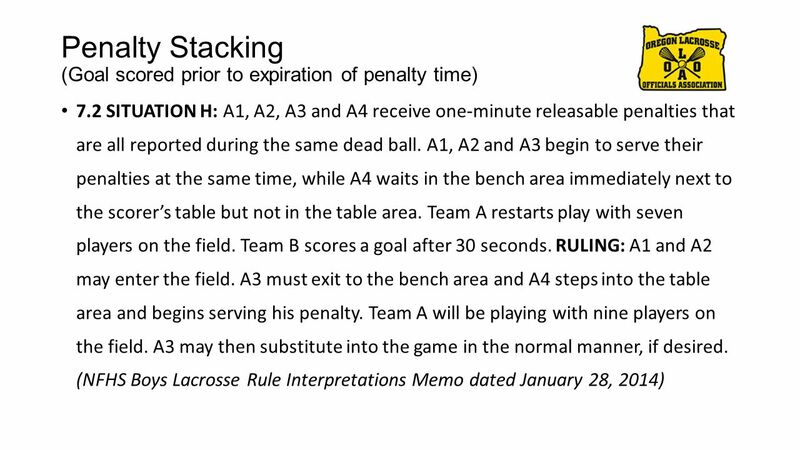 OHSLA SCOREKEEPERS & TIMEKEEPERS TRAINING Agenda Introduction Purpose / Objectives Overview Lacrosse Terminology Timekeeper Role Scorekeeper Role. Petaluma Youth Lacrosse TimeKeeper/Scorer Tutorial. PERSONAL vs. TECHINCAL FOULS The Technical Fouls (Pushing, Holding, Warding off, conduct etc.) Fouls that cause an unfair advantage! Vs. The Personal.